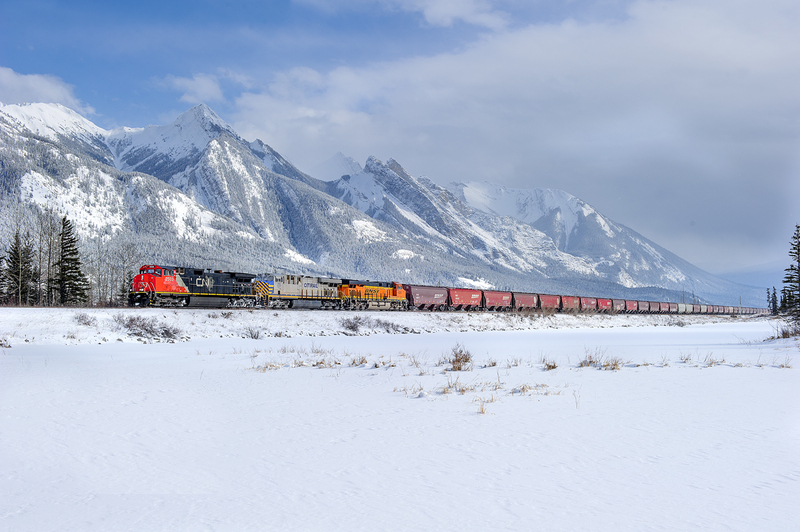 Railpictures.ca - Tim Stevens Photo: Due to ongoing problems on BNSF’s Hi-Line subdivision in Montana, there have been quite a few grain trains detouring on CN tracks between Vancouver, BC and Emerson, MB/Noyes, MN. Here we see CN C44-9WL 2503, CREX ES44AC 1317 and BNSF ES44C4 4261 leading CN F30651 05 (a.k.a. BNSF X INBNIL9 04) eastward on CN’s Edson Sub at Henry House. | Railpictures.ca – Canadian Railway Photography – photographie ferroviaire Canadienne. Caption: Due to ongoing problems on BNSF's Hi-Line subdivision in Montana, there have been quite a few grain trains detouring on CN tracks between Vancouver, BC and Emerson, MB/Noyes, MN. Here we see CN C44-9WL 2503, CREX ES44AC 1317 and BNSF ES44C4 4261 leading CN F30651 05 (a.k.a. BNSF X INBNIL9 04) eastward on CN's Edson Sub at Henry House. Very nice, Tim. What a backdrop in this scene. Nice work.